Why should we have a political puppet in New Delhi, when Nagpur is the 'capital' of India? Pseudo-nationalists who had zero contribution in our freedom movement want to appropriate Bharat Mata ki Jai. 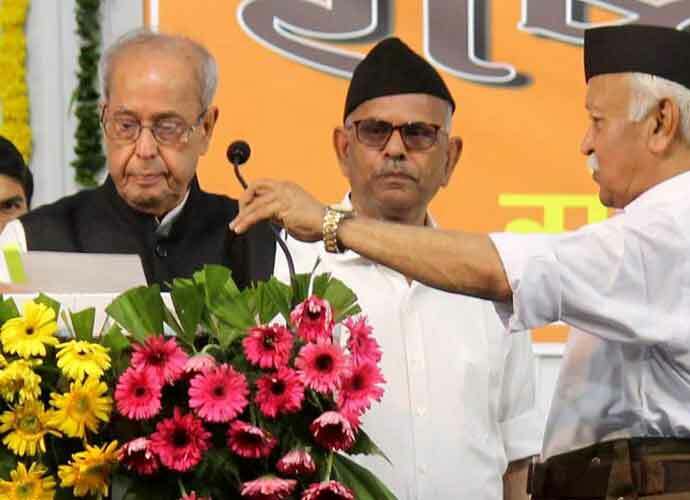 Amid the televised brouhaha caused by former president of India and senior Congress leader Pranab Mukherjee's visit to RSS headquarters, one missed the woods for the trees. Mr Mukherjee uttered the expected platitudes to an essentially poker-faced audience, which begged the critical question; can a fleeting presence of a staunch secularist overwhelm decades of ingrained communal calcification? Senior cabinet minister in Prime Minister Narendra Modi’s government MJ Akbar wrote the following in his well-researched book, Riot After Riot, “After all if the Hindus and Muslims live in peace, how will the RSS find another convert?”. It is a loaded assessment. Can a fleeting presence of a staunch secularist overwhelm decades of ingrained communal calcification? Akbar basically stated that a socially tranquil India where peaceful communal harmony prevails would cause an existential crisis for the RSS. The latter thrives amid religious polarisation, the raison d’ etre of its inherent being. Akbar himself further exposes BJP’s political hypocrisy with his unequivocal comment on their ideological mentors in Nagpur: “RSS represents Hindu revivalism of the worst sort; its members become the most dangerous clandestine force, determined to provoke violence." Enough said. Interestingly, Modi has called Savarkar a true patriot. So, is the killing of Gandhi act of love for the motherland, Prime Minister? Try decoding that, my friends. Good luck. Neither the RSS nor the Hindu Mahasabha took part in the Civil Disobedience movement and the Quit India movement. Savarkar made five mercy petitions to the British while in jail, surely that cannot be called remotely patriotic at a time when Congress leaders and workers were protesting on the streets and languishing in prisons in thousands. Several were thrashed or killed. RSS leader MS Golwalkar rejected synthesised nationalism; the architecture of cultural amalgamation in India irritated them. Instead, they were emboldened by the Nazi extermination of six million Jews. They lionised Adolf Hitler and Benito Mussolini who were terrorising the world with their brutal annihilation of ideological adversaries, targeting Jews and resistant-forces with unparalleled brutality. Gandhi’s non-violence and satyagraha was not just seen as absurd by RSS but was also deemed an anathema, an avoidable prescription. RSS wanted to nationalise churches as well. Their entire existence is based on minority-bashing and treating them as second class citizens, subjugated to a majoritarian philosophy. Narendra Modi contumaciously dumped the time-honoured tradition of PMs attending annual iftar parties hosted by the president at Rashtrapati Bhavan. Golwalkar misled Mahatma Gandhi into believing that they had no role whatsoever in exacerbating the Partition tensions and the horrific killings that followed. Then he did his famous U-turn after a trusting Gandhi ended up attending an RSS rally in Delhi. Years later, an inspired Kalyan Singh as UP Chief Minister deliberately misled the Supreme Court on Babri Masjid demolition, even after submitting an affidavit guaranteeing its protection. Of course, LK Advani shed bucketful of crocodile tears. But that’s another story. 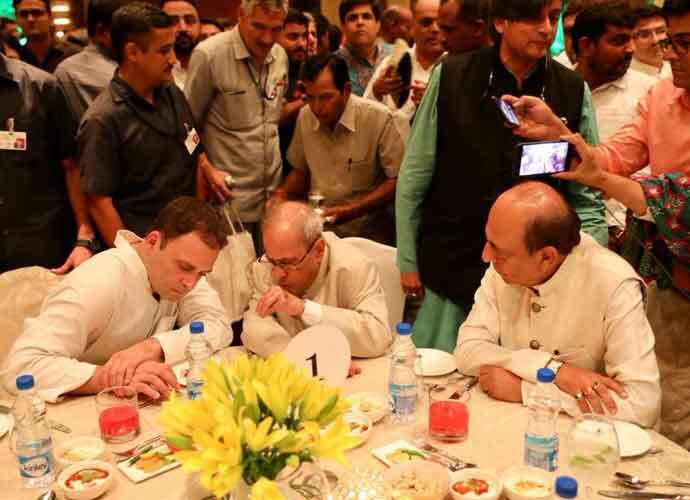 Narendra Modi contumaciously dumped the time-honoured tradition of prime ministers attending annual iftar parties hosted by the president at Rashtrapati Bhavan. Even Atal Bihari Vajpayee adhered to this earnest practice. The religious prejudice can be captured in the fact that there is not a single MP from the Muslim community among BJP’s 272 MP’s in the Lok Sabha. Modi’s government even opposed the Sachar Committee (which highlighted acute minority-exclusion in India’s growth story) when he was Gujarat CM. According to RSS worldview, a pucca nationalist is one who is anti-minorities. They glorified Gandhi’s assassin Nathuram Godse, some wanting to construct a temple for their national hero (Sakhsi Maharaj, BJP MP being one of them, who then hastily withdrew his comment but after the political messaging was done). It is not Amit Shah, Giriraj Singh and Co who are the pioneers of the go-to-Pakistan Sangh zeitgeist the original credits go to Savarkar, who called Congress “traitors and enemies” because of its ideology of assimilation and absorption of all religions within a unified multicultural hue. Gandhi summarised RSS brilliantly: “A communal body with a totalitarian outlook", both intolerant and exclusivist in its intrinsic nature. The Sangh Parivar has cunningly calibrated Hindutva nationalism as Indian nationalism. Can they explain why RSS opposed the tricolor for several decades post-Independence? The goal of the RSS is to make strident Hindutva, currently a minority within the secular tolerant Hindu religion, into a majority. It is an insidious, assiduously managed program of gradual infiltration into both institutions and susceptible minds. Because Hindutva claims to stand for the majority community, nationalism becomes an easy-sell to capture public imagination. The ultimate paradox is that pseudo-nationalists who had zero contribution in our freedom movement want to appropriate Bharat Mata Ki Jai, a brilliant camouflage to propagate their parochial politics. It is also called as chicanery. Nationalism becomes a clever subterfuge to package religious bigotry. Dr Shashi Tharoor has painstakingly deconstructed the RSS/BJP attempt to hijack Hinduism in his exquisitely essayed book, Why I Am A Hindu. Hinduism is eclectic, it has universal osmosis at its nucleus, Hindutva is more a regulated political mobilisation programme, says Tharoor. Segregation and ghettoisation of the minorities is the marker of this philosophy. Quite simply, why shouldn’t the RSS just cut the elaborate artifice and simply replace BJP as the official political party and assume full democratic responsibilities? Why should we have a political puppet in New Delhi, when Nagpur is the effective capital of India? Why shouldn’t RSS pass a formal electoral test instead of this unabashed subterfuge of being a socio-cultural organisation? And TV channels will then need to invite just one spokesperson from the Sangh Parivaar instead of the cozy couple who grace prime-time shows. National Spokesperson of the Indian National Congress party. Co-author, The Superstar Syndrome.